Southwestern Alaska to central California. Coniferous forest, often at forest edges or under canopy openings. 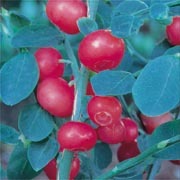 Red huckleberry occurs in mixed evergreen forests, particularly abundant in wet or dry, coastal western hemlock or western hemlock-Sitka spruce forests. Western Red Cedar, Douglas Fir, and Salal. Seeds can be picked in July – August when fruit is ripe. To germinate stored seeds, alternate warm and light conditions (28ºC for 14 hrs/day) with cool and dark conditions (13 for 10 hrs/day). Seeds can be stored in a refrigerator for up to 12 years. Seed, container, bare root, cuttings. Adapted to coarse and medium textured soils, low moisture use. Seeds, container, cuttings, or bare root. 1800 to 11000 plants per acre. Water moderately for first year, prefers partial sun. Slow growing, erect shrub to 4 meters tall, moderate lifespan.